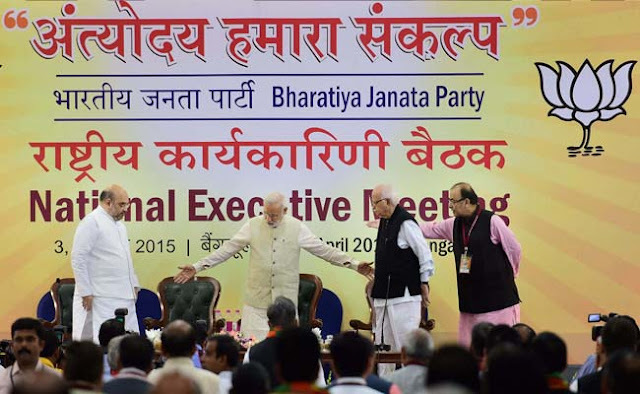 The Bharatiya Janata Party (BJP) National Executive and the officer bearers meeting will begin in Capital City, New Delhi today, according to the sources, the two-days meeting will discuss current political situation in the country and strategy for the ensuing Assembly elections in five states. Party President Amit Shah will inaugurate the meeting where two resolutions related to political and the General Budget will be adopted. Prime Minister Narendra Modi will address the concluding session on Sunday. It will be the first National Executive after Amit Shah took over as President for the second term. The meeting comes in the backdrop of recent controversy over alleged anti-national slogans in JNU and the death of a Dalit scholar in Hyderabad University and Jat quota agitations in Haryana. Get latest online news, taaza, breaking news updates, political, business, entertainment, movies, music, national, international, state news. Janatha garage Leaked full song "Apple Beauty"
Social media is the collective of online communications channels dedicated to community-based input, interaction, content-sharing and collaboration. Copyright © 2015- All Rights reserved Taaza Vaartha. Made with ❤ in India.